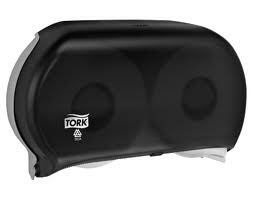 Particularly, toilet paper dispensers in public restrooms. These are perhaps some of the coolest and simplest designs ever and also the most horribly misused. So, as I said yesterday, the first step is to identify the problem that needs solving. Here it is. Public restrooms are used by a lot of people and are maintained, not by the people who use them – like in your house, but by people who are hired to do so. It is of the utmost importance to guarantee that there is always toilet paper available to the user. And it is of extreme value to minimize how often the janitor has to visit the room to restock that toilet paper. Back before the awesome double large-roll dispensers were invented, this was typically solved by stacking more rolls on the back of the toilet. This created other problems, like risking the rolls falling off, thus getting wet and dirty and making a mess of the bathroom. It also forced users to use toilet paper that someone else’s hands had likely been all over. No, the modern person not only wants guaranteed toiled paper in their stall, they want it untouched by others. Enter the double large-roll dispensers. The idea is simple. Two very large rolls, side-by-side. People use the front one until it is emptied and then they use the back one. The janitor just has to come by with enough frequency that they get there before the back one is emptied. They move the back one to the front, put a new one in the back, and voila! Well, almost. It’d be a perfect system if it was only used by engineers and other hopelessly analytical people. Unfortunately, there aren’t enough of us in the world to form critical mass. The first problem is that people don’t always take from the front roll. This wouldn’t be so bad if we could all at least agree to take from whichever one was smaller. Then the system could still work. But, no. Many people don’t pay attention. So sad. At work, whenever I notice that the paper is hanging down from the big one, I carefully tuck it away and pull down the end from the small one. Later that day, they’ve switched again. I am forced to conclude that someone is actively sabotaging me. Someone is so clueless as to actually believe it is better to take from the fuller roll! People! Sheesh. There is a design out there that does away with this problem. It’s the kind they had in the bathrooms where I used to work. These have a clever lever that blocks access to the back roll (see the red arrow below). 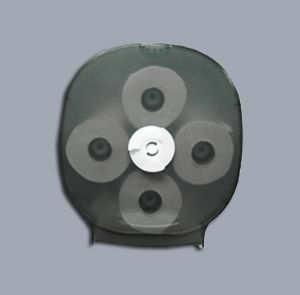 Once the first roll is empty, users can slide it forward until it latches. They can’t move the lever early because of a divider (see the yellow arrow) that prevents movement until the front roll is empty. Once moved, however, users can access the back roll. Now, this does depend on people being smart enough to figure out how to work the sliding lever. But at least if they can’t figure it out, they only deny themselves toilet paper. They don’t muck up the entire toilet paper distribution system. Regardless of the specific design of the dispenser, my main beef is with the janitors. Their wanton disregard of the design is particularly alarming. Especially since they arguably went through some sort of training for this job and either they are very inept at retaining important information or their supervisors fail to see the value in properly training their employees in the finer aspects of the job. In both my previous work area and my current, when one of those jumbo rolls gets close to empty, the janitor pulls it out and sets it on top of the dispenser. Or the hand rail. Or the sanitary napkin disposal unit sticking slightly out from the wall. Whatever surface he or she can find. Why? WHY??!! No one uses the roll. It just sits there and people use the ones in the dispenser. And eventually one of them gets smallish and… gets placed on top of the previous one. At one point, I walked into a stall and found seven – SEVEN! rolls stacked on top of each other in 2 or 3 piles. Some of the rolls didn’t even qualify as smallish; they were about an inch thick. Remember the problems inherent with rolls not contained within the dispenser? I had had enough. I had slowly been stewing about the stacked rolls but the seven roll pile pushed me over the top. I asked my admin who was in charge of the janitors and sent that person an email. 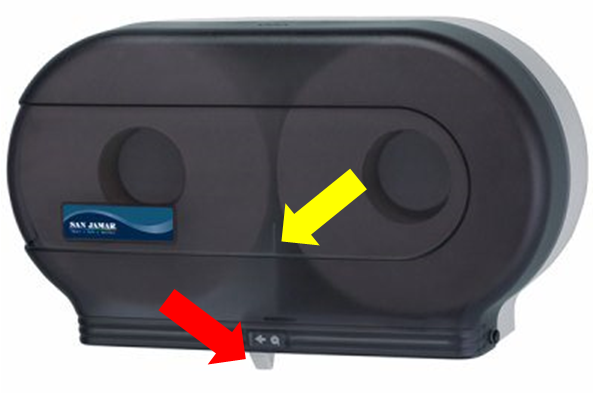 I detailed how the dispensers were supposed to work and what their crazy, untrained employees were doing instead. But! All the extra rolls vanished. I couldn’t help but suspect that they went straight to the trash, as did all future prematurely extracted smallish rolls. This really bothered me. Not because it was costing my company money but because it wasn’t necessary. If they would just stock the rolls like they are supposed to, the waste could be eliminated! And that, really, is the true problem facing designers. The problem is making your elegant design obvious enough that even the average dimwit will benefit and use it correctly. Fail in that regard and, no matter how elegant and perfect your design is, you fail overall. I am hopeful that after years (literally) of wringing my hands about the mishandling of the dual roll toilet paper dispensers in public restrooms, this rant will be the panacea I need. I hope that having gotten this off my chest, I can again enter the bathroom without my usual angst about the ignorance of the general population with regard to one of the most beautiful day-to-day design marvels of our times. P.S. When I went looking for pictures, I found the following. I’m pretty sure I’d drool just a bit, or at least feel my heart rate increase, if I came across one of these. I am fascinated by the design of things. Not big things like skyscrapers or complicated things like airplanes. I am intrigued by the simple, mundane, every day objects. The objects that are so simple, mundane, every day that the average person doesn’t even notice that there is a design. In fact, they often misuse the object and miss out on the beauty that went into it. 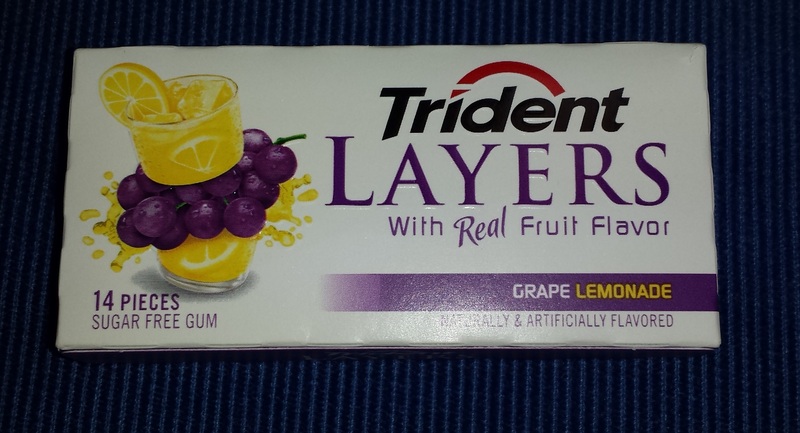 Take the Trident Layers gum package, for example. Every design starts with a problem to solve. 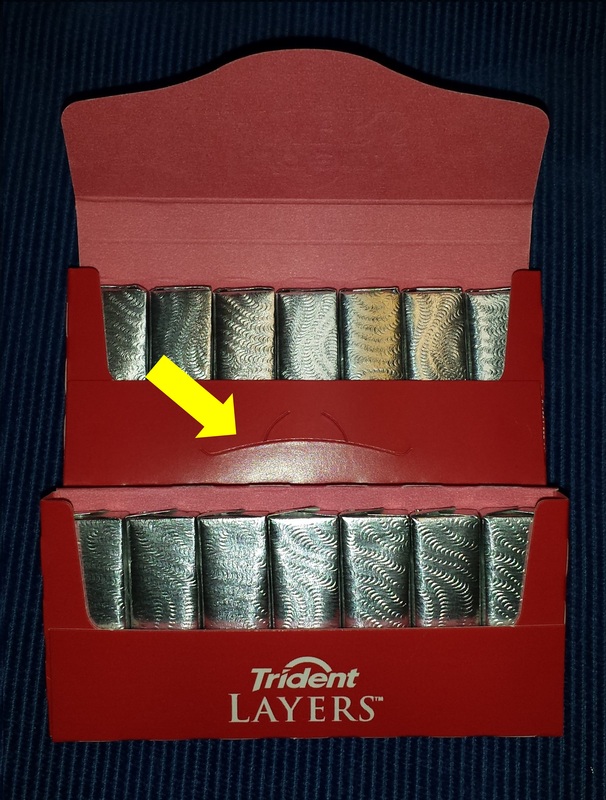 The problem to solve with gum packaging is how to keep the package from collapsing and messing up the tidy arrangement of gum as pieces are removed from the package. I like how this package solves that problem. 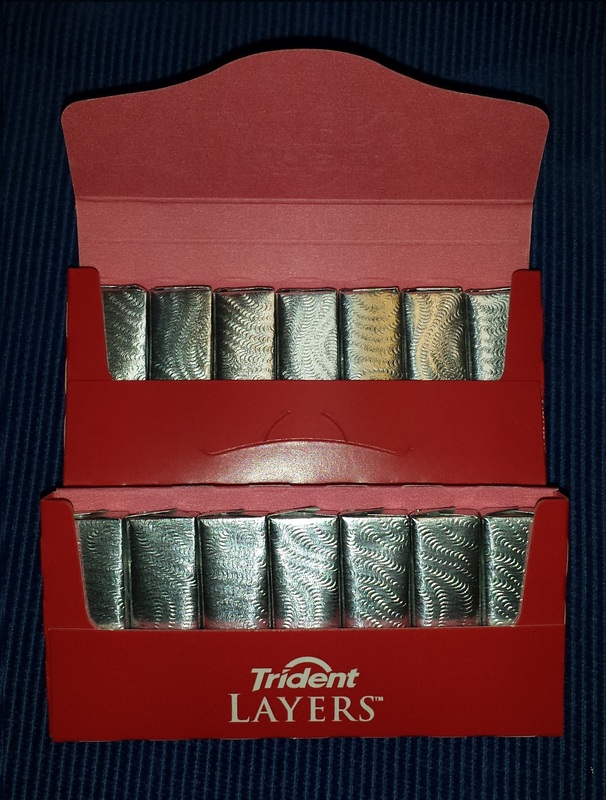 There are two rows of gum. We’ll call them the top row (near the flap) and the bottom row. There is a slot in the backside of the bottom row so you can fold that row into the top row and then secure it closed with the flap. But the whole result could start to get crushable once there’s only a few pieces of gum left. There’s also a perforation between the top and bottom rows. 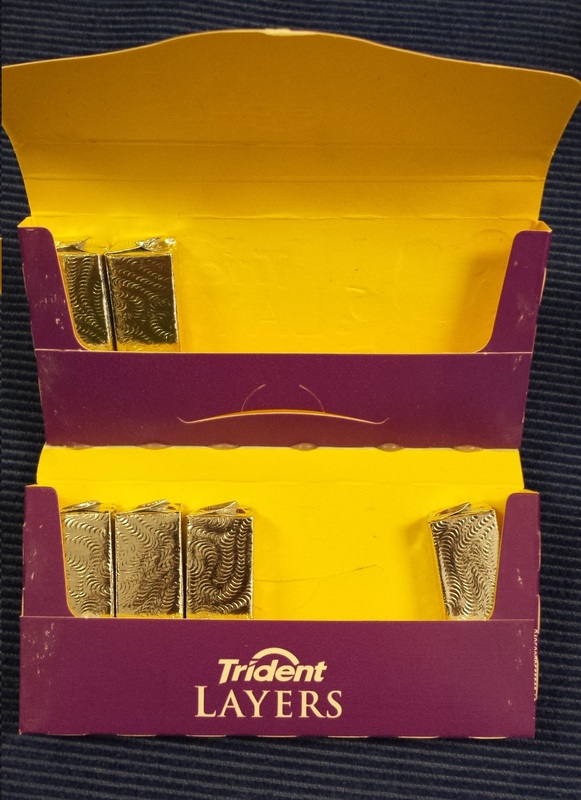 Once you’ve consumed all the gum on the bottom row, you can tear that part of the packaging off and secure the flap in the top row slot, leaving you with a tightly secure, non-collapsing gum package. Beautiful! The design, elegant as it is, depends on consumers using it properly when they, by and large, don’t notice or care about its elegance. I noticed and as a result, I use the package as designed. My boys, on the other hand, just want a piece of gum. The design is rendered useless unless the consumer is willing to use it as designed. And that’s what fascinates me about the design of such things. The gum package isn’t too bad. I can – and will – train my children on the proper extraction method of gum from packages in my purse. Other people selecting their gum improperly does not impact me. That’s not true for all daily use designs. Some have public impact. One in particular has become a ridiculous obsession of mine for an embarrassingly long time. At great risk to your continued belief in my sanity, I will share my tale of woe tomorrow. Yesterday was a very long and draining day. The night before, I had literally collapsed in my husband’s arms. I’m still not sure what happened. One minute, we were hugging. The next, my knees were buckling and I almost fainted. He says I was swooning for him. All joking aside, it scared me just a bit. He checked all my vitals, which were fine. I crawled into bed and worried. And then I looked up “stroke symptoms in women” on my phone (my right hand had briefly gone numb as well, likely a pinched nerve). And then I lay awake worrying about whether I should have gone to the emergency room. Needless to say, my already sleep-deprived state was not improved that night. The next morning, my head still felt a little swimmy but I prepared myself for work. All day, I felt a little “off”. Sometimes I felt light-headed but generally, I just felt weak – not unlike how I feel after donating blood. At work, I soon found out that I needed to drive two hours to pick up something needed for my job. After talking to a nurse friend, my husband and I decided that he would drive me – just in case whatever happened the night before happened again. It didn’t. But the four hours on the road didn’t help my recovery either. I spent a couple more hours at work and then went home. My husband was, of course, now very behind on what he planned on doing that day so he got back to it while I ran Jane to volleyball practice. When I got home, I lay down for awhile. I just kind of stayed in a funk, eventually getting up to tell my husband that I had no intention of fixing dinner. I then sat down on the couch to eat some cold leftovers and later asked my youngest if he wanted the last piece of leftover pizza. The middle child, I told to fend for himself. As I sat on the couch, preparing to go retrieve our daughter, Daryl came in. It was 7:40 – less than an hour before his bedtime. “I just found out it was due tomorrow today.” (I doubt that very much). I stared at him for a minute, not having the energy to delve into all the social, political, racial issues bubbling up in my head. The fact that (what I would consider) “true” African immigrants are not nearly the same thing as the large ethnic group we refer to as “African Americans” seemed too complex for me to handle. “Looking up ‘African American recipes’ online will turn up recipes that people, most likely primarily from the South, would fix today, not what the slaves brought with them,” I finally managed. My brain wasn’t functioning. And I didn’t want to help research and fix a dish after returning from volleyball practice. I walked out to my husband’s studio and spat out the incredible tale of our son’s forgetfulness and what now needed to happen. “How seriously do you think they are going to take this?” he asked. And, of course, Jane’s coach kept the team an extra thirty minutes for a pre-tournament pep talk. And then we went to the store and bought a cornbread mix. And then I got home long after the boys went to bed and lay down again and decided the cornbread could wait until morning. After all, the rotten child whose idea it was should play a significant role in its preparation. Hal is at that stage of life when a person desperately wants to be independent but isn’t quite up for the task… yet. This is in contrast to people at the other end of the spectrum who desperately want to be independent but aren’t quite up for the task… anymore. There are some remarkable similarities if you stop to think about it. No one likes to regress. Hal likes to pour his own milk, which makes me quite nervous. He wants to get things out of cabinets. He wants to buckle himself in the car. And brush his own teeth. And put the DVD in the player by himself. And operate the remote. And walk the powerful, difficult-to-manage dog. And feed said dog. And put her in her crate. Pick his own clothes. Brush his hair. Choose the dinner menu. Pour the salad dressing. And that last desire brings us to last night. He hates vegetables. His only solution to this problem is to insist on Ranch dressing anytime vegetables are served. Cooked or raw – doesn’t matter. The only vegetables consumed without Ranch are peas… presumably because they are too small to dip. Yesterday, he made it clear that he did not want green beans – the most despised of the “regulars” in our house. Never mind that the green beans consumed on Easter were fresh and lightly steamed and everyone else loved them. I agreed that we would not have green beans. I fixed broccoli, cauliflower, and… asparagus instead. “I said no green beans!” he protested as he got close enough to the table to see that there were long green stalks waiting on his plate. “I know. There aren’t any green beans on the table,” I responded. He spied the strawberries on the table and reached for them. For Hal, that meant the single stalk of asparagus, broken in two, a half dozen small pieces of broccoli and cauliflower, 2 raw sugar snap peas, and a handful of raw baby carrots. An old hat at getting the Ranch out, he headed to the fridge and then returned to his plate. I didn’t hover nearby. Big mistake. That’s Hal, head down and crying. 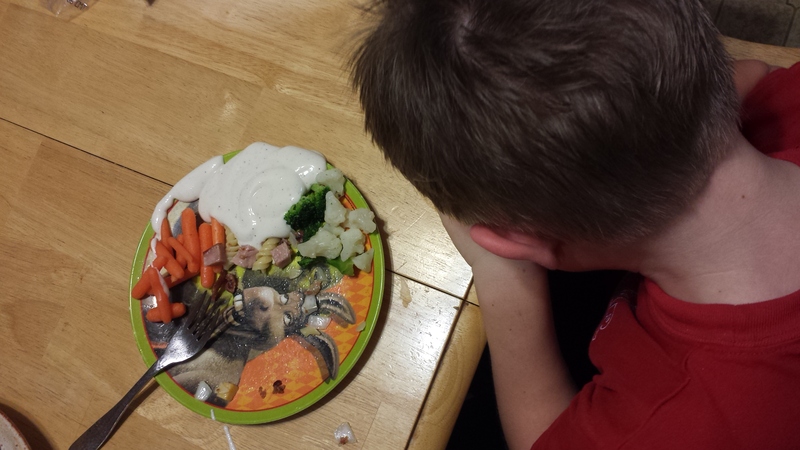 He’s not crying because he wasted half a bottle of Ranch. He’s not crying because his Daddy yelled at him, nor because his siblings are laughing. He’s crying at his loss of independence. For him, it’s as devastating a loss as an older person losing the right to drive. I’m an intelligent woman. I’m well educated and I know plenty of information other people don’t know. Unless it’s pop culture. Or more specifically that stuff that people know without ever saying how they know it. The underbelly of society stuff. The stuff best researched in The Urban Dictionary. When it comes to that stuff, I’m the clueless girl that everyone likes to laugh at. My sister-in-law loves to play Cards Against Humanity with me. That game is like a version of Apples to Apples that has gone very, very bad. I honestly don’t know too many people who could play that game without getting offended. At least a little bit. Every once in awhile. She likes playing with me because of a rule that says a person can turn in a card if they don’t know what the card means… provided they fess up to the group that they don’t know the term and listen to someone explain it to them. She loves hearing what terms I’m not familiar with. And then enlightening me. I was shocked several years ago to find out that my husband actually knew who you could buy drugs from in our high school. I seriously didn’t have a clue. No, beyond that, I didn’t think there were any fringe people at all. We were a wholesome bunch, I tell ya. All 2000 of us. Well, except maybe that guy that wore all black and had a chain hanging between his ear and nose piercings. But even him, I didn’t want to judge too quickly. Maybe he just wanted to be unique. Surely he wasn’t on drugs. This trait of mine is apparently not genetic, however. Jane was talking about a Skyping conversation she had with three friends: one male, the others female. I wasn’t listening too closely but I heard her say that the boy was talking and made a joke about his Happy Trail. “What’s a Happy Trail?” I asked. “You don’t know what a Happy Trail is?” my husband called from the other room, dissolving into laughter. “She doesn’t know what a Happy Trail is!” my daughter called back to him. They both died laughing. “Am I ok with my daughter talking to a boy about a Happy Trail?” I asked him later. “We just listen,” he said. I’ve come to the conclusion that they are listening in all the wrong places. I’m just too high-brow for them and I’m okay with that. I may not know what a guy’s Happy Trail is, but hey! At least… At least I don’t know what a Happy Trail is. Or… I didn’t. Now I do. And I’m honestly confused how stuff like this reveals itself to them but not me. Am I really that clueless? Some folks recently moved into an area near my work area. Quite a few of them, actually. Now there’s a lot more people in the halls, bathrooms, and break rooms. Some of them are completely new to me, but some I recognize from other projects in times gone by. I encountered one of the latter on a recent morning and a name jumped front and center. Tim Smith. Immediately behind the name was a strong sense of doubt. That is not Tim Smith. He said he was good. We went our separate ways. I conjured up my mental image of Tim Smith. Yep. Not Tim Smith. I couldn’t remember who this guy actually was. No matter. That afternoon, we quickly passed each other as we rounded a corner from opposite directions. I stifled my laughter until I was a safe distance away. At least I hadn’t called him Tim.